Step 1 Trim the artichokes. If using mediums, quarter them lengthwise. Place them in a bowl of acidulated water (water with a little vinegar, lemon or lime juice) to prevent discoloration. Drain. Step 2 Cook the artichokes, garlic, red pepper flakes, saffron, orange zest, salt, olive oil and water over medium heat in a large, covered skillet until the artichokes are tender, about 15 minutes. Shake the pan from time to time to stir the contents. If necessary, add a little more water to keep the bottom covered. In Recipes-list.com we have selected the most viewed recipes from category - Vegetables Vegetarian . Enjoy the best recipes specially selected for you! 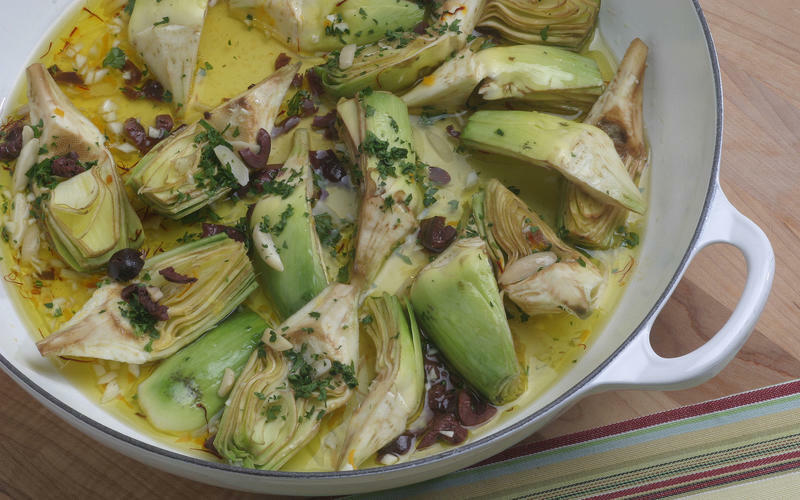 Artichokes braised with saffron, black olives and almonds is the right choice that will satisfy all your claims.